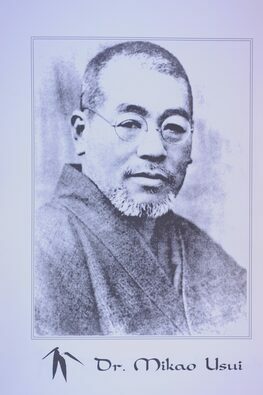 Reiki is a gentle, hands-on healing system that was developed by Mikao Usui in the early 1900s in Japan. 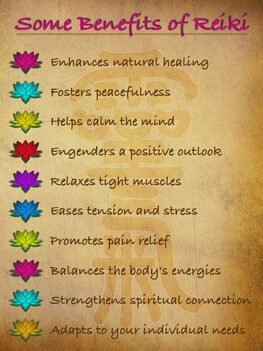 It promotes relaxation and stress reduction, which the body needs in order to heal itself. Universal Life Energy or Life Force, is what keeps us alive - it flows in, around and through us via pathways known as chakras, nadis, meridians and our aura, nourishing the organs and cells of the body and supporting their functions. When there are blockages or disruptions in these pathways, vital processes in our bodies are negatively affected which can lead to dis-ease and dysfunction. As William Lee Rand of the International Center for Reiki Training explains, "Reiki heals by flowing through negatively affected parts of the energy field and charging them with positive energy. It raises the vibratory level of the energy field in and around the physical body, and causes negative energy to break apart and fall away. In so doing, Reiki clears, straightens and heals the energy pathways, thus allowing Life Force to flow in a healthy and natural way." Reiki can never do harm. It adjusts itself to what a person needs at the time, and creates the effect that is in the highest and most loving good for that person. It is always helpful. My clients commonly report that they experience a positive difference in how they feel physically, emotionally and/or spiritually following a Reiki session. These changes can be subtle or dramatic, immediate or noticeable after some time has passed. It is also possible for clients to feel effects that are not immediately positive. This is usually due to the release of long-standing negative thoughts or feelings that the client has consciously or unconsciously accepted about themselves. Reiki recognizes when it is time for a person to let these issues go, and will bring them to the surface for the client to process. Although unsettling at first, clients soon realize that releasing thoughts and feelings that are no longer serving them makes room for more love, happiness, peace and joy in their lives. A note about "hands-on" healing: When you hear that term, it may evoke visions of religious acts, rites and miracles. Many religions DO incorporate hands-on healing into their doctrines. Underneath those doctrines, however, lies Universal Life Energy which belongs to everyone, is accessible by everyone, and is available to everyone in a non-denominational, spiritual, but non-religious manner. 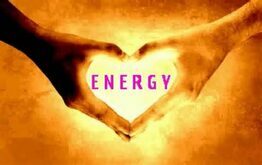 That Universal Life Energy is what I focus on in my energy work. No witchcraft, no hocus-pocus, just healing that you will experience in any number of ways. I don't take your energy from you, and I don't put my energy into you. It is my belief that we are all born with the innate ability to heal ourselves and others - our ancestors proved that long ago. We evolved into what we are today, before modern medicine, by relying on hands-on healing. Reiki practitioners do not diagnose conditions, perform medical treatments, prescribe medications, recommend supplements, nor interfere with the treatment of a licensed medical or, in the case of animal clients, a veterinary professional. It is recommended that clients see a licensed physician, or licensed health care professional for any physical or psychological ailment they may have, and that animal companions see a licensed professional veterinarian for any health issues they may have. 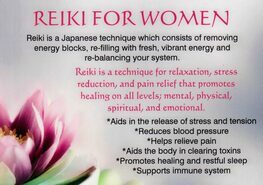 Reiki practitioners are not licensed by the State of Washington. Evening and Saturday appointments are available. Ask about gift certificates and multiple session packages!